I'm sure you're rolling your eyes with that title. Clever, I am not. 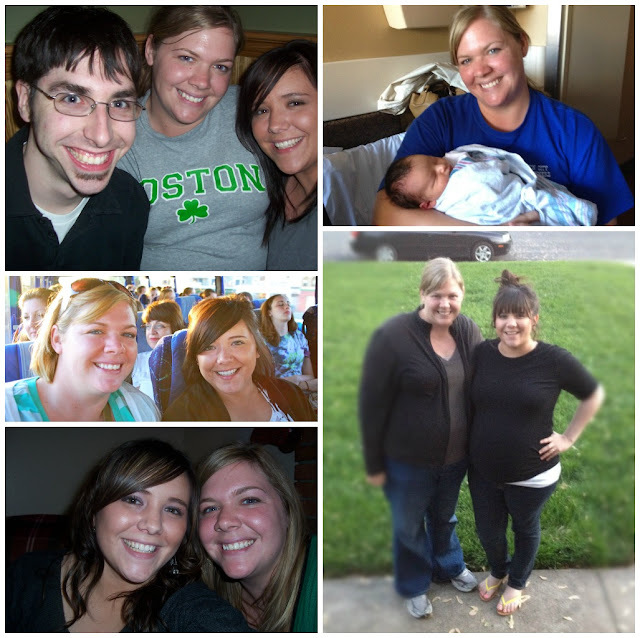 Lately I have been finding myself balancing this working mom life a little better these days. Probably because: 1. my kiddo is mostly sleeping through the night and 2. when Theron's awake he's been mostly happy. Woo to the hoo. Win, win. Perhaps the cutest thing I've seen in a long time! 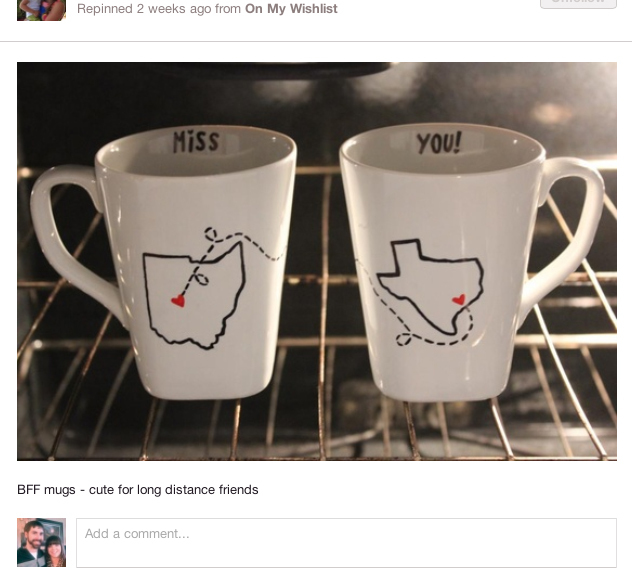 I saw it just a couple days before Christmas and knew I wanted to recreate them and personalize them for my bestie who lives in Texas. We stopped doing gifts last year but this was a must. 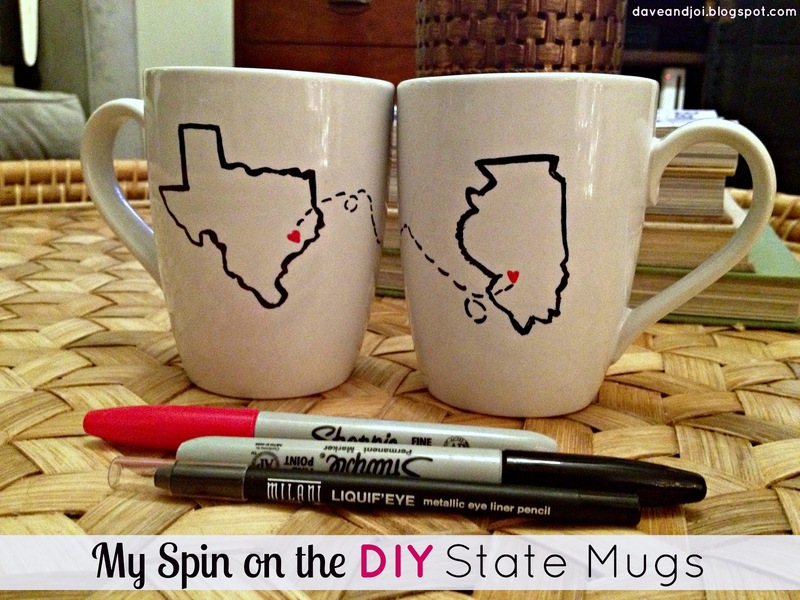 The toughest part in DIYing the mugs would be free-handing Illinois and Texas--probably two of the hardest states to draw for this non-artist! 1 - I bought some white mugs and a package of fresh new sharpies from Big Lots. 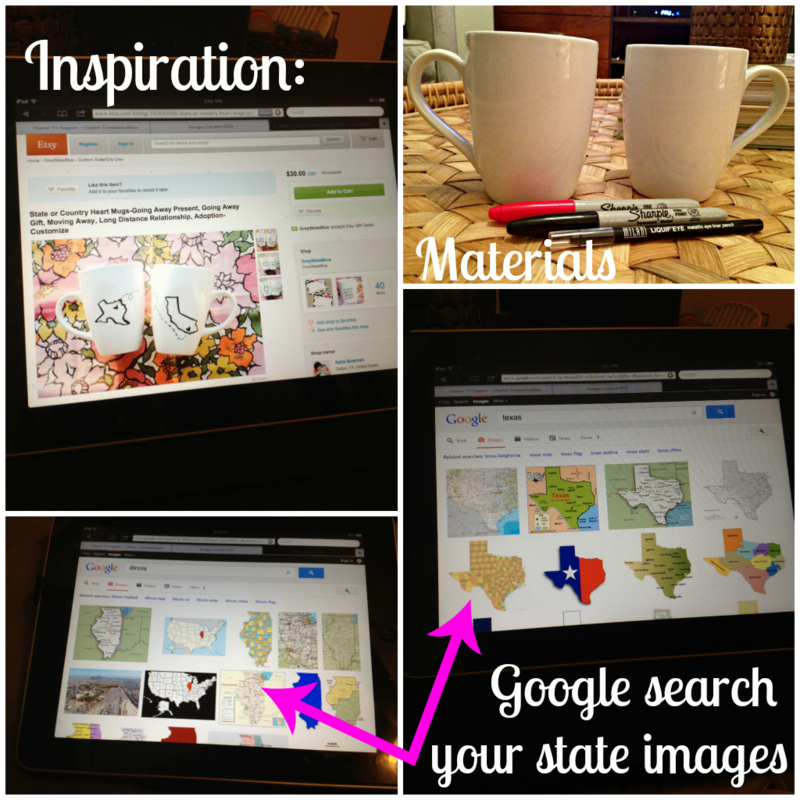 2 - I googled some images of Texas and Illinois and practiced drawing them a couple of times before drawing on the mugs. 3 - Once I was mostly happy with my renditions, I drew the states on the mugs with black eyeliner. Once finished, I traced with a black sharpie and then waited awhile for it to dry and then rubbed the eyeliner off. 4 - I let them dry overnight and then baked them at 400 degrees for nearly an hour. [I had read in the comments that a lot of people had problems with the ink coming off while washing them and the ones that cooked them longer + at a higher heat seemed to have better luck.] My bestfriend doesn't have a dishwasher so they should last a little longer--at least that's what I am hoping! My sweet best friend loved her homemade gifts and I was so happy to give her something meaningful and from the heart. Here's hoping she'll be home soon...for good! p.s. More posts are in the works--we've got project playroom happening right now. Eek! Those turned out great! I can't wait to hear how they fair in the dishwasher. I really want to do this (sharpie on mug) but so far all the instructions I've found have been using paint Sharpies, not the normal ones. Good luck with yours! I'm hoping they hold up for my bff! How cute are these? I love it! Yours turned out so good! Seriously in love with these.. they look perfect!! Terrible blonde comment...but who gets which state?! Did you give both mugs to your friend or did you keep one? If so which one?